We had a huge windstorm and I happened upon these Canary Pine boughs while walking. I was amazed at the size of their needles, some of which are 14 inches long. 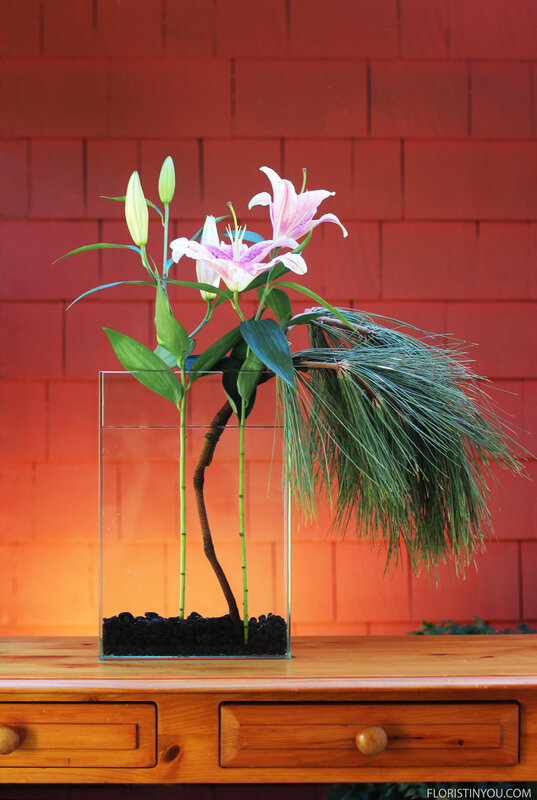 I thought the tall, slim, plate glass vase would be a perfect way to display them. This is a very large arrangement. It stands almost 27 inches high, perfect for a mantle. 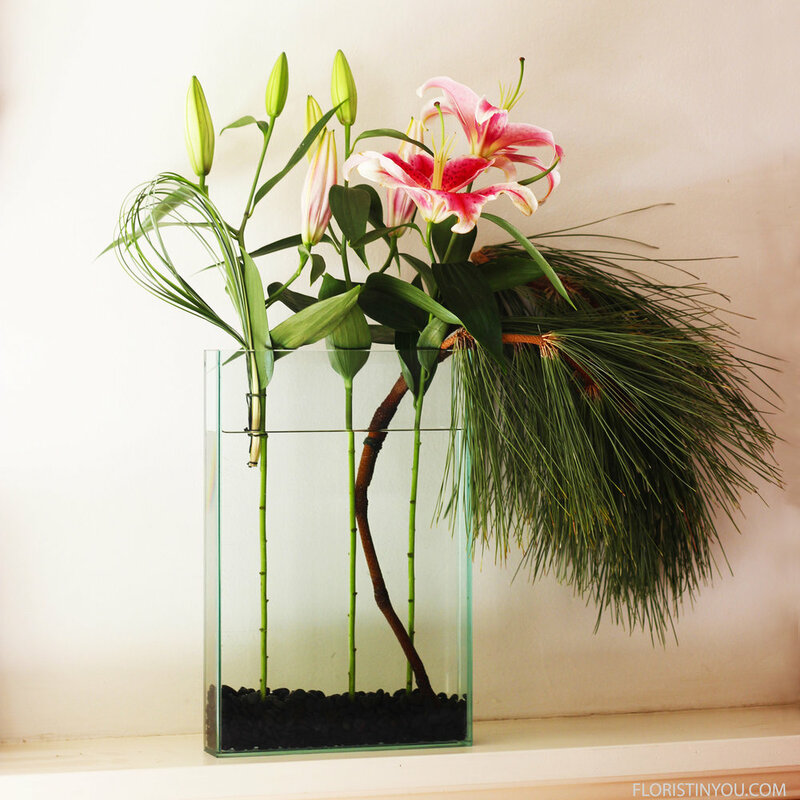 The pine boughs are accented with 3 stems of pink Lilies, some of which are just beginning to open up. 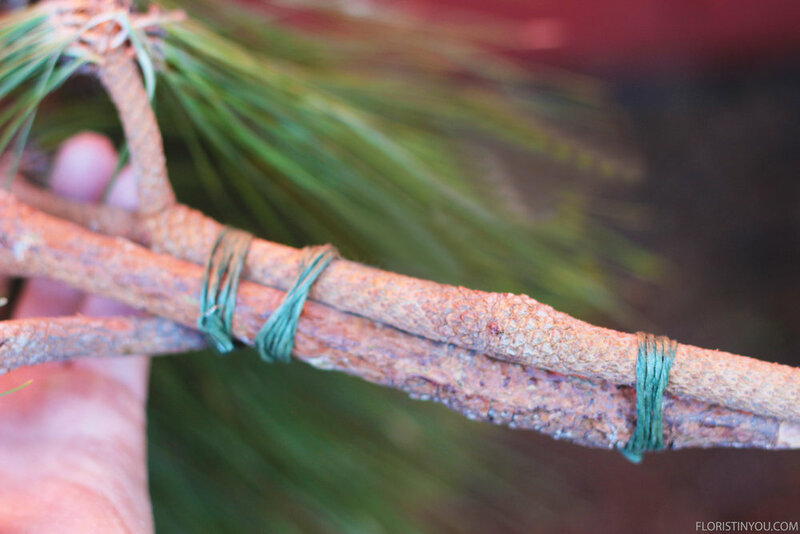 Floral Tip: For binding the two pine boughs together, and also for making the Bear Grass loop, you will use a special type of wire called bindwire (purchase here). It is made of wire that is paper wrapped and has a waxy feel to it. It can hold things with quite a bit of weight and stay secure. Floral Tip: Remove orange lily stamens with a plastic fork. (They can stain fabric and fingers.) Use a Q-tip to remove any orange left on lilies. 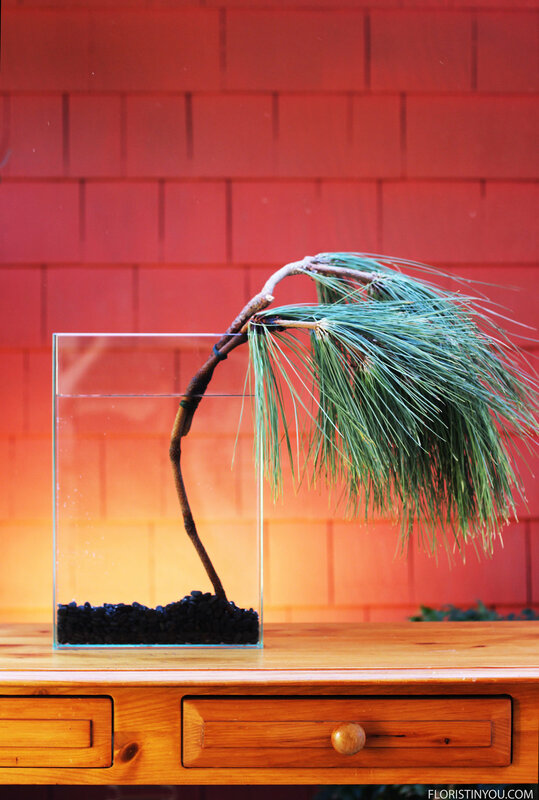 Well if you have your flowers and pine, let’s begin. Tilt vase to side and slide in stones. You need 2 inches. Add water to 3.5 inches below rim. Position 2 branches so they look as one. (Shown from side.) Wrap 4-5 times. Double knot. Repeat 3 inches down. 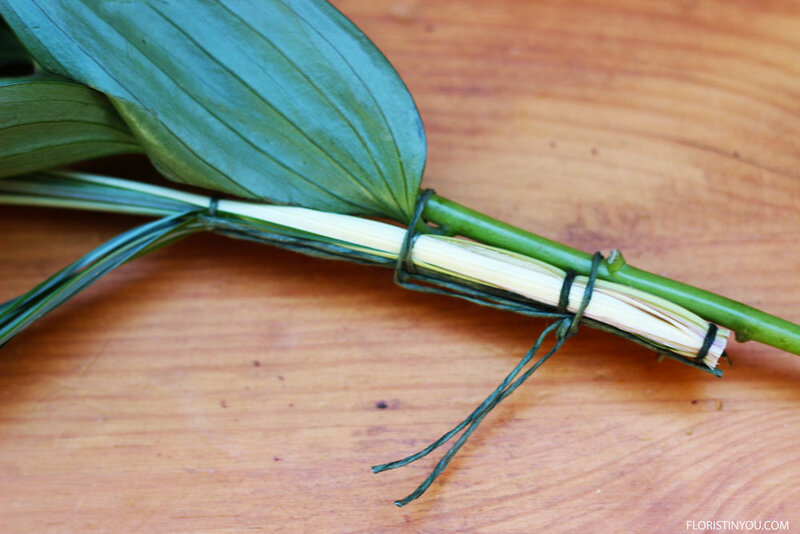 Make loop with Bear Grass. Wrap bindwire around. Double knot. Repeat 5 - 7 times. Position loop next to lily. Wrap bindwire around both. Double knot. Repeat. Trim Bear Grass. This is a large arrangement. It is 27 inches high. Perfect for a mantle. 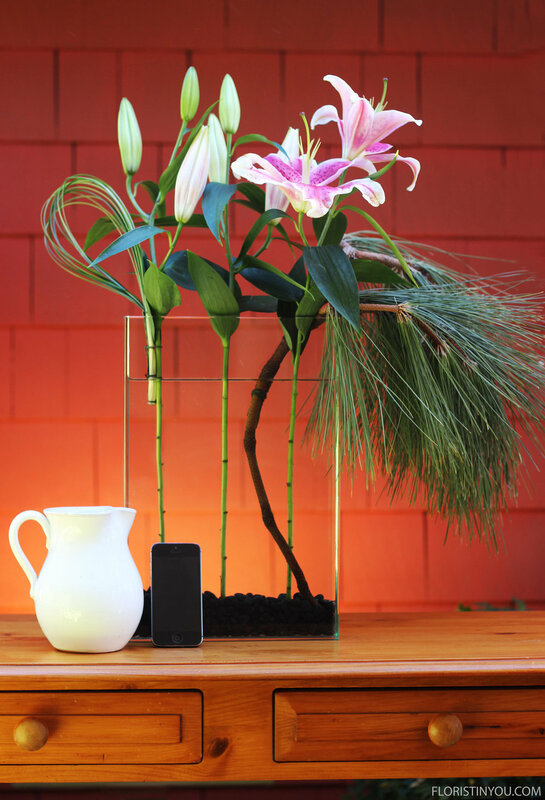 See the scale of the arrangement next to a cell phone and a pitcher. Remove orange stamens with a plastic fork. Clean up orange powder with a Q-tip. Here’s a close up of the lilies.